Now we move on to the nitty-gritty of actual techniques that were intended to build agents that could deliver messages that the enemy could not extract, or kill without remembering or understanding the event. With programming like this, it would be nearly impossible to trace any actions by the agent back to the source of the plot; it would create a “Manchurian Candidate”. 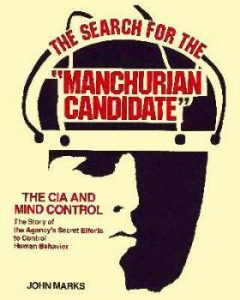 The term “Manchurian Candidate” was coined in Richard Condon’s novel by the same name, later made into a shocking movie that introduced the concept of programmed assassins to the viewing audience. The origins of the concept however, go back to the Korean war, and the troubling robotic confessions by US pow’s of committing war crimes. It turns out the American military committed many, many crimes in that war, including dropping containers of fleas infested with plague on villages. Whether the North Koreans and Chinese had effectively “brainwashed” the American Prisoners or not, it was an opportunity for American intelligence to pull out all the stops and conduct similar experiments to catch up with “Communist mind-control” techniques. Let’s begin by looking at the deeply researched book by John Marks called “The Search For The Manchurian Candidate”, published in 1979. While hypnosis is only one of the techniques the CIA used to bend minds, that is the subject of this article. There are at least 16 main citations regarding hypnosis, and the text eludes to deeper involvement. “Since World War 2, the United States government, led by the Central Intelligence Agency, has searched secretly for ways to control human behavior”. Such work “touched on the fantasies of the mind- accessible, in ancient legends, to witches and wizards who used spells and potions to bring people under their sway”. Drawing on techniques used by the Nazis, pioneers such as George Estabrooks began to unpack the human mind. Estabrooks will be the subject of a future article. The point man in 1950 was Sheffield Edwards, who Marks says “would personally handle joint CIA-Mafia operations..”. The project was code-named “Bluebird”. Later under the leadership of Morse Allen, the CIA was given $100,000 to develop electric shock and hypnotic techniques. The Korean War was the catalyst that drove further research. Marks comments that “By the end of the Korean War, 70 percent of the 7,190 U.S. prisoners held in China had either made confessions or signed petitions calling for an end to the American war effort in Asia. Fifteen percent collaborated fully with the Chinese, and only 5 percent resisted”. This convinced the CIA that the soldiers had been “brainwashed”, and the agency expanded the experiments. The CIA studied the methods that the Communists were known to use internally; the Soviets used brutal humiliation and constant punishment by guards. In four to six weeks the prisoner would break down. The Chinese were more subtle, using peer pressure from fellow inmates and a deep indoctrination of Marx and Maoist theory. Ironically, both methods seem to be in play at U.S. “Black Sites” and the prison at Guantanamo. The CIA had no use for the subtle method. Instead, they oversaw crude experiments like the ones practiced by Dr. Ewen Cameron at The Allan Memorial Institute. Cameron experimented with “depatterning”, where hapless patients with common psychological problems had their personalities wiped clean in true brainwashing fashion. These included combinations of sensory deprivation, electroshock, and being drugged into comas for weeks at a time. “..a staff member woke up the patient three times a day for medication that consisted of a combination of 100 mg. Thorazine, 100 mg. Nembutal, 100 mg. Seconal, 150 mg. Veronal, and 10 mg. Phenergan”. Cameron would then begin what he called “psychic driving”, in which hours and hours of recorded instructions were played in a loop to the drugged subject. It was a process that was supposed to implant a new personality to replace the previous, depatterned personality. The poor subjects were eventually returned to their families as broken, ruined individuals from the trauma. Chapter 11 of “The Search For The Manchurian Candidate” is completely about hypnosis. The concept was to create an individual who would kill on command and not remember the event. Agency man Morse Allen would hypnotize various secretaries and employees, getting them to steal, set fires and even shoot their co-worker in a mock execution. Agents were given instructions under hypnosis and told they would not remember this when they were brought out of trance. In some cases, they allowed the subject to be caught and arrested to see if they could stand up to interrogation. “The Counterintelligence program had three goals: 1. to induce hypnosis very rapidly in unwitting subjects; 2. to create durable amnesia; 3. to implant durable and operationally useful posthypnotic suggestion”. All these efforts were intended to provide the CIA with deniability as to any connection with a particular assassination, but Marks concludes his analysis by saying he found no evidence that the agency had ever used these techniques to build a killer. “Hypnosis expert Milton Kline says he could create a patsy in three months; an assassin would take him six”. Richard Condon’s novel “The Manchurian Candidate” was later made into a movie starring Frank Sinatra as Major Bennett Marco, Laurence Harvey as Sargent Raymond Shaw, and Angela Lansbury as Shaw’s devious, plotting mother. The movie was remade in 2004 with a plot twist, but for this article we’ll stick with the original 1962 film. It’s difficult to describe the plot in a few short words, but Marco and Shaw’s unit is captured in Korea and “brainwashed”. The survivors who have returned home experience nightmares and vague recollections of the experience. Sinatra’s “Marco” gradually discovers that Shaw is the key player in an assassination plot; Shaw’s stepfather is a vice presidential candidate with a McCarthy-like streak that raves anticommunist rhetoric. Shaw has been programmed to shoot the presidential candidate, leaving his stepfather to seize the reins of power. The movie boldly showcases hypnotic mind control techniques in a way that shocked audiences and contributed to the overwhelming paranoia of the era. Those with a real interest in the movie, may find the book “What Have They Built You To Do? 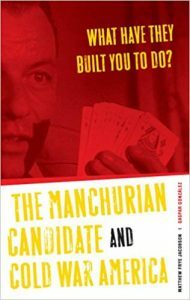 – The Manchurian Candidate and Cold War America” a great companion read to the movie. “The Manchurian Candidate” was directed by John Frankenheimer, who became close to the Kennedy brothers. Frankenheimer had been contacted by John Kennedy and was encouraged by Kennedy to turn the book “Seven Days In May” -(about a military coup plot against an American President) – into a movie. “President Kennedy had read Seven Days in May shortly after its publication and believed the scenario as described could actually occur in the United States. According to Frankenheimer in his director’s commentary, production of the film received encouragement and assistance from Kennedy through White House Press Secretary Pierre Salinger, who conveyed to Frankenheimer Kennedy’s wish that the film be produced and that, although the Pentagon did not want the film made, the President would arrange to be visiting Hyannis Port for a weekend when the film needed to shoot outside the White House. According to the book “What Have They Built You To Do?”, Frank Sinatra “..went to John F. Kennedy to secure his blessings” for “The Manchurian Candidate”. The movie went missing for years, only to reappear on television in the 1970’s. Popular speculation was that the movie was pulled because the plot was too similar to the actual Kennedy assassination, however the book “What Have They Built You To Do?” describes that the actual reason was a contract dispute with Sinatra. Please note: Sirhan-Sirhan may not have been the actual assassin; multiple authors have provided evidence that the police destroyed key items from the shooting scene. Witnesses have said Sirhan was restrained and could not have fired the fatal shots. Sirhan was likely a hypnotized “patsy”. “The Manchurian Candidate” may just be the perfect cold-war movie. It introduces the audience to mind control and a frightening level of conspiracy. It set the stage for the later movie thriller “The Parallax View”, which treads over the same mind-control patsy-assassin format. But what is more amazing is that our CIA (and no doubt other countries spies) have been using these techniques and, despite the alleged closing of the program and the destruction of the MKULTRA files – these techniques can only have gotten more intense. In the next article we will take a look at chapter 8 of “Using Hypnotism” by G.H. Estabrooks. The title of the chapter is “Hypnotism in Warfare”. Interestingly, Estabrooks – allegedly the first to create a “Manchurian Candidate” assassin – is only briefly mentioned in the book “The Search For The Manchurian Candidate”. This entry was posted on October 21, 2018 at 5:57 pm and is filed under Book review, Hidden History, Kennedy assassination. You can follow any responses to this entry through the RSS 2.0 feed.